What do you think? 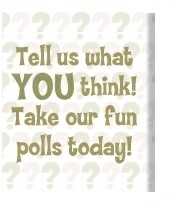 If you participate in our fun poll, you'll just get the results! No phone calls, no mail, no prizes; just the results posted RIGHT HERE!! 1) Who will be the Republican Nominee for 2012? 2) Who will be the Democratic Nominee for 2012? 3) Would Joe Biden settle for Secretary of State? 4) Does BIG FOOT exist? 5) Will TIME TRAVEL ever be possible? Wait I have to come back from 4099 first! 6) Will mixing ROGAINE & VIAGRA make your hair stiff? Don't know but willing to try!